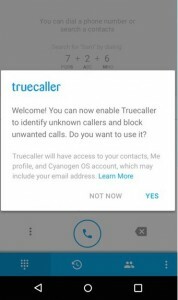 Cyngn has struck a deal with TrueCaller to integrate it with the default dialer app on Cyanogen OS 12.1. For a privacy-conscious person like me, it was totally unacceptable given the notorious reputation of TrueCaller. Read this post on XDA-Developers for more details. Here is how I got rid of TrueCaller. Before installing the OTA on my OnePlus One, I turned off mobile data and Wi-Fi so that I could prevent any internet access till I removed TrueCaller. The phone rebooted after installing the Cyanogen OS 12.1 OTA update (which has been pulled due to some issues at the time of writing this). Immediately after that, I opened the dialer and was prompted to enable TrueCaller. I refused it by selecting Not Now. I also went into the settings menu of the dialer app to make sure there was nothing related to TrueCaller enabled by default. All this just disables TrueCaller but does not remove it entirely. Read on if you want to completely remove it. Since the TrueCaller app does not show up in the App Drawer, go to Settings ? Apps ? All and scroll down to the TrueCaller Service app. 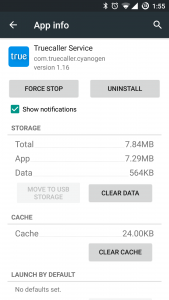 Tap on it and uninstall it from the App Info page that shows up. Now your phone should be free of TrueCaller and its privacy issues. 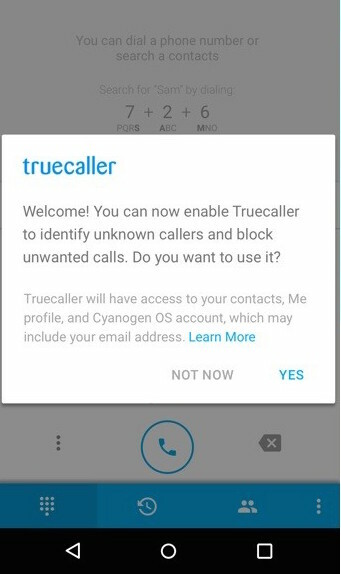 If you go to the settings menu of the dialer app, you can verify that there are no settings related to TrueCaller. This should work for any device for which Cyanogen OS 12.1 is released. In case you have a change of mind after doing this and want to reinstall TrueCaller, you can do that by navigating to /system/vendor/bundled-app/TrueCaller folder using the File Explorer app and installing the APK that is there. The /system/vendor/bundled-app/ folder contains the APK files for all the other pre-loaded (but removable) apps like Boxer, Browser as well. If I get you right, this doesn’t actually remove the dialer, only the lookup service? I like the True caller integrated dialer. But right now cyanogen accounts are not working. So can you help me to remove the cyanogen login from the true caller integrated cyanogen dialer? Many thanks in advance.